Watch the video below to see Everypaw’s vet, Anna, demonstrating how to check a dog’s fur and skin. Fleas: what are we dealing with? As a parasite, every flea needs a host - basically a mobile hotel with a free, well-stocked mini-bar. Domestic pets are well-fed, healthy and live somewhere nice and warm. As hosts go, our furry friends (along with their baskets and blankets) offer the flea equivalent of 5-star accommodation. Over time, subspecies of fleas have evolved to prey on different types of animal (hence you get dog fleas, cat fleas and human fleas). That said, many fleas can and will infest more than one species. In fact, the cat flea is one of the most commonly encountered flea species among the dog population. You can see them pretty easily with the naked eye. They’re brown and around 2.5mm long. Easy to spot on the fur of a Westie; less so with a Chocolate Lab. They really are expert jumpers. Some types of flea can jump more than a hundred times their own body length. Individual fleas can survive for a long time. Some fleas can live up to a year. Adult dog fleas can live up to 100 days. And a female can lay up to 50 eggs a day - so it’s easy to see how an infestation can soon take hold. Flea eggs can take up to two years to hatch. If an adult flea lays its eggs in your dog’s coat, they’ll usually hatch within two weeks. However, if the conditions aren’t quite right, they can survive in a dormant state for a long time (up to two years!). Many eggs are laid in carpets and rugs, resulting in a rapid build-up of hungry flea numbers. If your dog is scratching, licking or chewing certain areas of the body more than normal, it’s a sign that something’s irritating their skin. It could be fleas - but it might be down to another cause such as dry skin or an allergic reaction. Check their fur for actual fleas. Turn your dog onto their back to check the groin and armpits (fleas prefer these spots as they are warm and protected). Next, comb through your buddy’s hair with a flea comb (this is a metal comb with close-set teeth). It’s best to do this over a white surface or a piece of paper so you can inspect any droppings that fall out. If there are black specks on the paper, and if these turn red-brown when you pour a little bit of water on them, this pretty much confirms that fleas are present. Why are fleas bad for your dog? Individual dogs react in different ways to fleas. Most become increasingly more scratchy as the infestation takes hold. If they’re constantly rubbing, scratching or licking the same area, there will typically be hair loss, the skin will break and infection can set in around the scratch sites. Some dogs develop an allergy to flea saliva, known as flea bite dermatitis. Even with just one or two bites, this can lead to severe itching and inflammation. Episodes of flea bite dermatitis tend to get worse as your dog gets older. Fleas bite their hosts to feast on their blood. Bite-by-bite, we’re talking tiny amounts, but it can become a bigger problem as the infestation grows. Loss of blood over time can lead to anaemia, especially in very young or old dogs - and in smaller dogs that have less blood to spare. Fleas also carry tapeworms. If your dog swallows fleas (by licking his fur, for instance), they can end up eating tapeworms, too. These worms make their home in the intestine, where they interfere with the absorption of nutrients. Are dog fleas bad for humans? While the fleas that infest dogs have a definite preference for canine blood, they will often bite humans, too. Typically, a bite leads to a very small area of redness and itchiness that soon passes (like a mosquito bite). 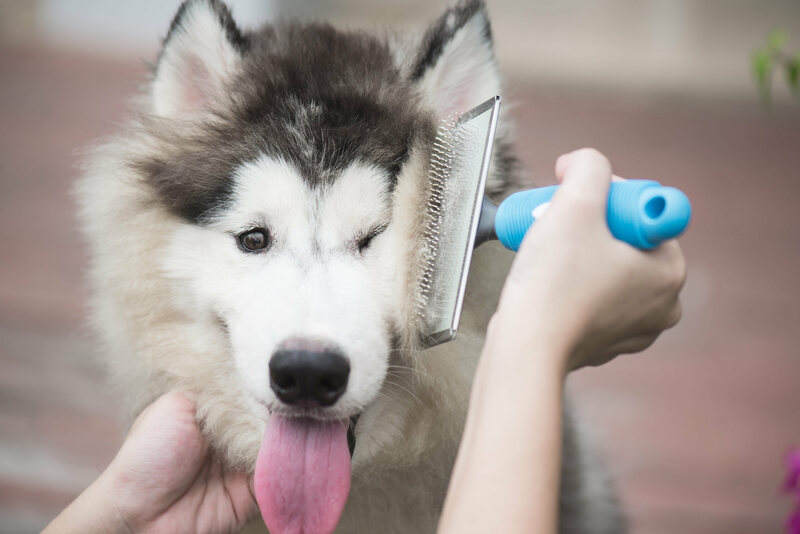 But just like dogs, humans can get flea bite dermatitis, where even a single bite can cause a lot of irritation and swelling. Fleas are most likely to jump from dog or carpet to human where the infestation has grown very large, or if your dog likes to come into your bed and the fleas have got into the sheets or duvet. If fleas are present, consult your vet. There are lots of flea treatments out there, and your vet will recommend the best one for you, based on the age, breed and size of your dog. Typically, the treatment takes the form of a “spot on” capsule applied to the skin at intervals or an oral preparation. Pevention is essential and requires repeated application through the year. Severe infestations,(such as occur after closing the house up for a holiday) require treatment of pooch’s bedding, carpets and rugs. Meanwhile, get cleaning! Wash all bedding and vacuum the furniture, floors and skirting boards. At the same time, especially if your dog has flea bite dermatitis, your vet may prescribe some anti-inflammatory or antihistamine medication to reduce swelling.